Switch from the car to the YOYO+ with one click (car seat adaptors sold separately). The YOYO+ is, more than ever before, the urban pushchair for parents on the move. By using the Newborn Pack (included with this package option) you can use the BABYZEN YOYO+ from birth; your little cherry-pie will lie completely flat in the Nest carrycot (86 x 44 cm), facing you at all times. The BABYZEN YOYO+ carrycot comes with a 5-point safety harness, a 2-position pop up canopy, a foot cover and a headrest. From 6+ months, use the same frame, remove the 0+ newborn fabrics and replace with the 6+ fabrics to turn your stroller into a front-facing pushchair that can be used until your little pudding is 18kg. Without a shadow of a doubt, the BABYZEN YOYO+ makes a life with kids easier. Be a "zen" parent. Why should I buy the BABYZEN YOYO+ Pushchair White Chassis with Newborn and 6+ Colour Pack? One of the best-selling features of the BABYZEN YOYO+ Pushchair is its record small dimensions when folded (52 x 44 x 18 cm). At such an itty-bitty size, it can fit in tight storage spots and even in the overhead compartment of an aeroplane! Hence why this baby product is being hailed as a lifesaver among parents who spend much of their time between countries. The shopping basket is XXL meaning that you can pop all your groceries or library books underneath without having to hang annoying carrier bags on the handles. At a mere 6.2kg, the BABYZEN YOYO+ is described as a featherweight pushchair; but don’t you worry about comfort – what is lacking on size is made up for with cushioned and fully reclining seating, giving your little monkey a pleasurable position in which to observe their new world. Fabrics are machine washable and with an extendable sun protection canopy boasting UPF 50+, you can truly let bubba sit back and relax. The exclusive and patented 'soft-drive' system means that there is no need to lock the front swivel wheel, even on rough terrain, and the improved 4-wheel suspension gives the passenger of the BABYZEN YOYO+ Pushchair a smooth ride. Coming with its very own custom-made Carry Bag (with shoulder strap for ease of carrying and giving you hands free to hold onto little people), and a Raincover BABYZEN really have got you covered. 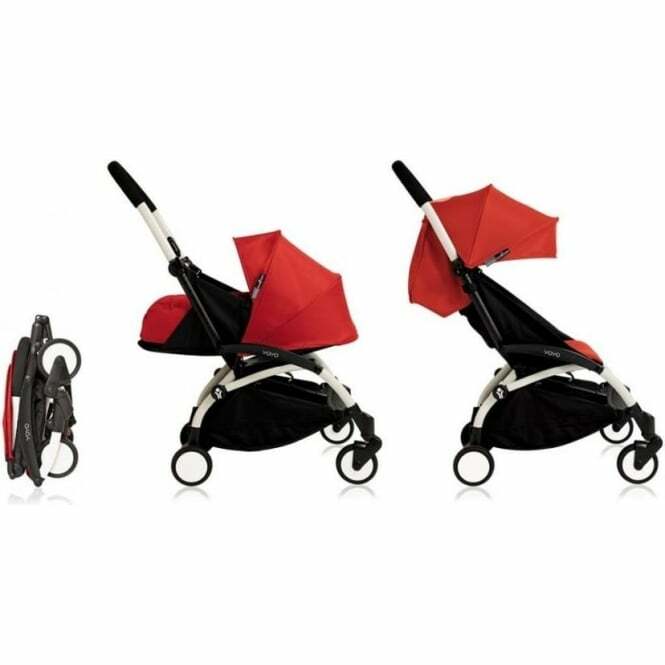 What is included in my BABYZEN YOYO+ Pushchair White Chassis with Newborn and 6+ Colour Pack? 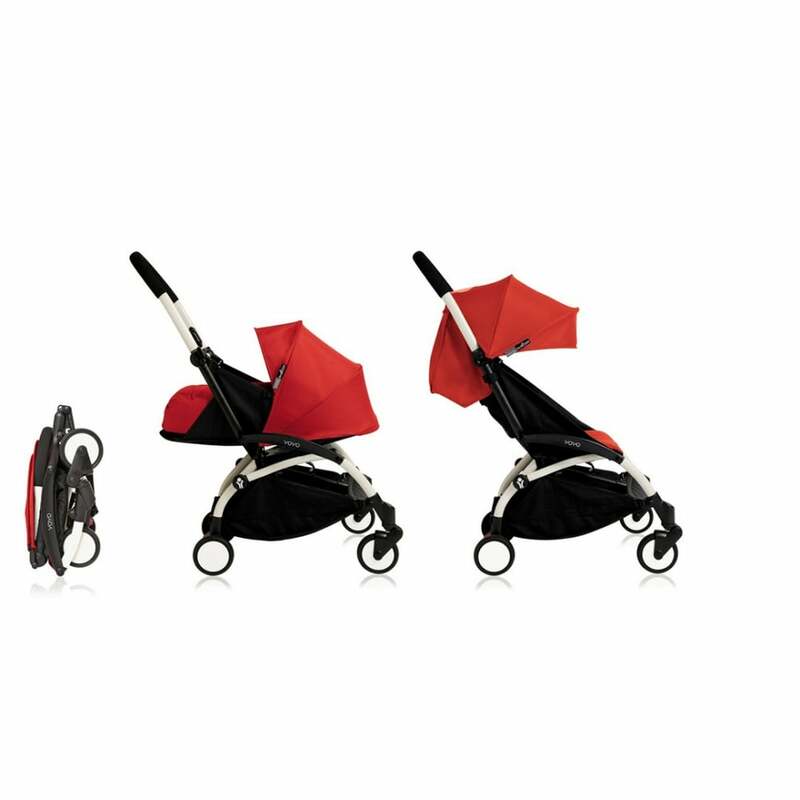 You receive a YOYO+ Stroller (white chassis with seat base and 6+ colour pack) and a Newborn Pack (nest and colour pack). Yes. There is also a BABYZEN YOYO+ 0+ or 6+ Mosquito Net, a BABYZEN YOYO+ 0+ or 6+ Raincover, a BABYZEN YOYO+ Parasol, a BABYZEN YOYO+ Wheel Pack, BABYZEN YOYO+ Car Seat Adaptors, a BABYZEN YOYO+ Cup Holder, a BABYZEN YOYO+ Footmuff, a BABYZEN YOYO+ Travel Bag, and a BABYZEN YOYO+ Board all available to buy separately. Do I get a manufacturer’s warranty for the BABYZEN YOYO+ Pushchair White Chassis with Newborn and 6+ Colour Pack? Showing our 2 BABYZEN YOYO+ Pushchair White Chassis with Newborn and 6+ Colour Pack reviews with an average rating of Excellent. Would you like to write a review? I love this pushchair and get compliments all the time when out with my little boy! Super easy to use/fold plus it fits in the back of my mini! I've recommended this to all my friends. Your Review - Light, small and easy to push. Everything included (which we found to not be the case in other brands!) and for a reasonable price. Folds small and is easy to carry whilst holding my little girl in the other arm, also really easy to push around one handed.